Description: To 100cm long. 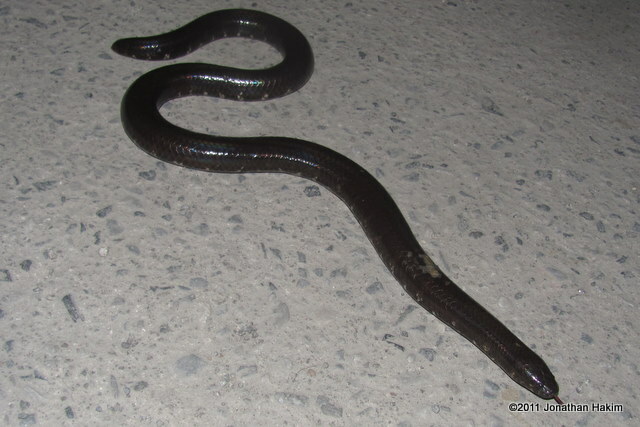 The thick cylindrical body is what gives it the name “pipe snake”, though it will flatten its body when engaging in its defensive display. Head is small and unmarked with very small eyes that are difficult to find. Tall is short and tapers quickly to a point. 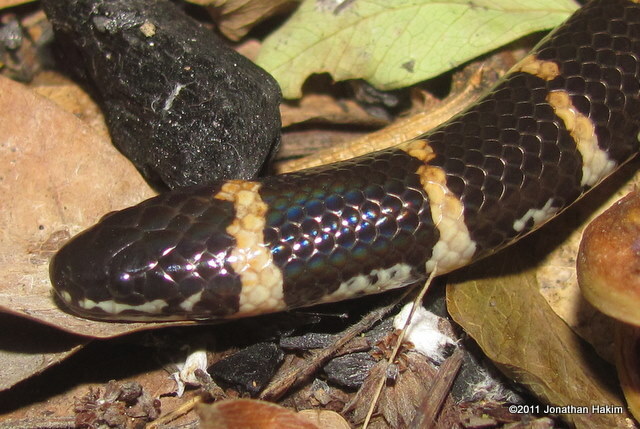 Scales are small, smooth, and iridescent. The body is dark brown to black; juveniles have narrow white bands that turn reddish brown and eventually fade out completely with age. Some populations lack the dorsal bands. 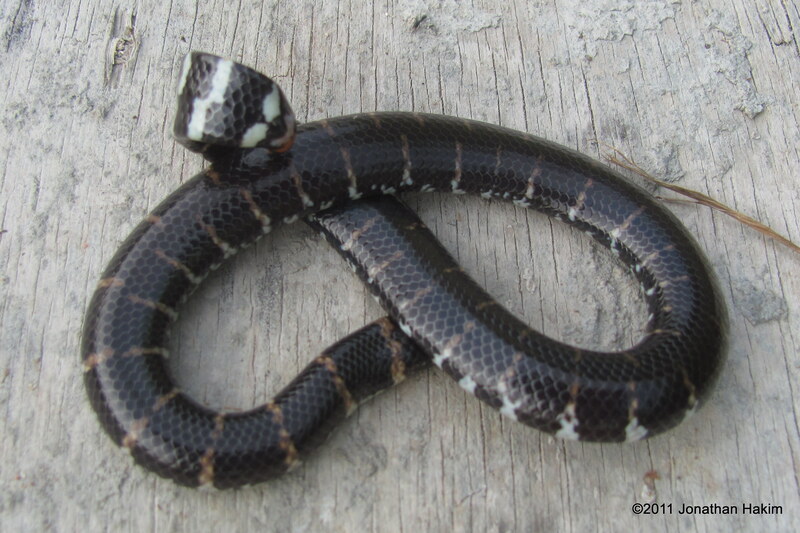 Underside has striking black and white bands. The tail is orangish-red on bottom. 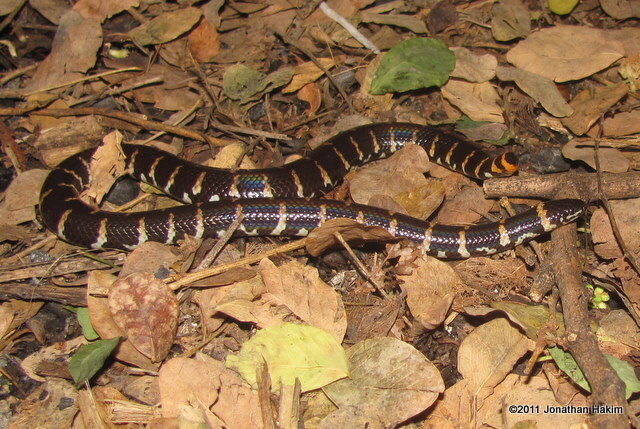 Similar Species: Sunbeam Snake has a long thin tail and a whitish-gray belly without banding. 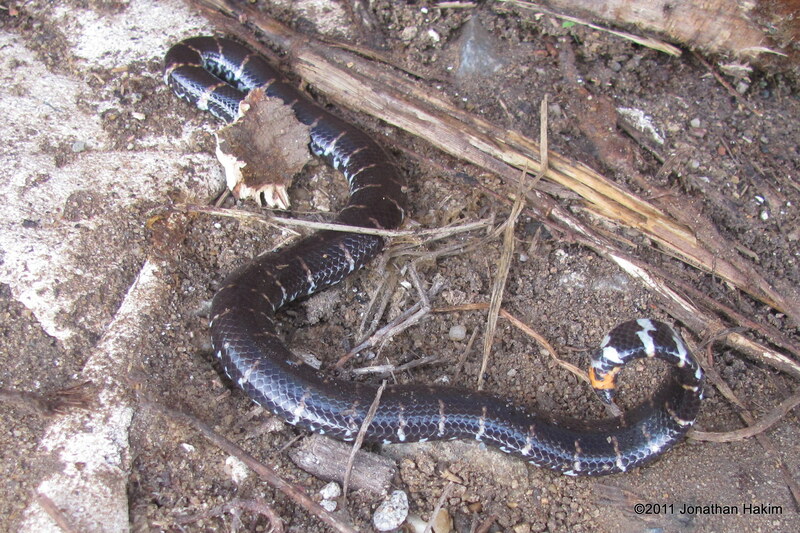 Puff-faced Water Snake has a broad, distinct head with clear markings, all-white underside, and keeled body scales. 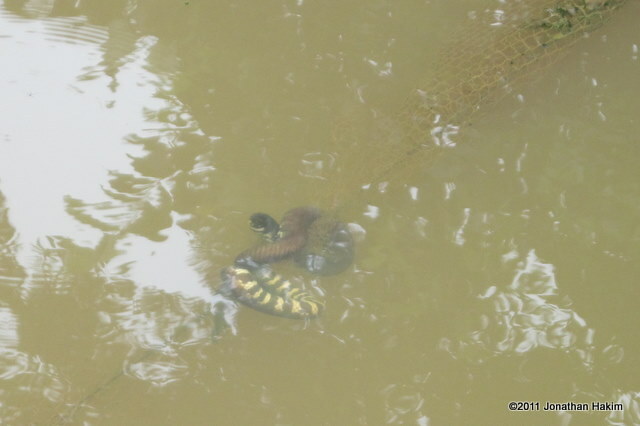 Yellow-bellied Water Snake has a broader head and uniform white-to-yellow on the belly with no bands. 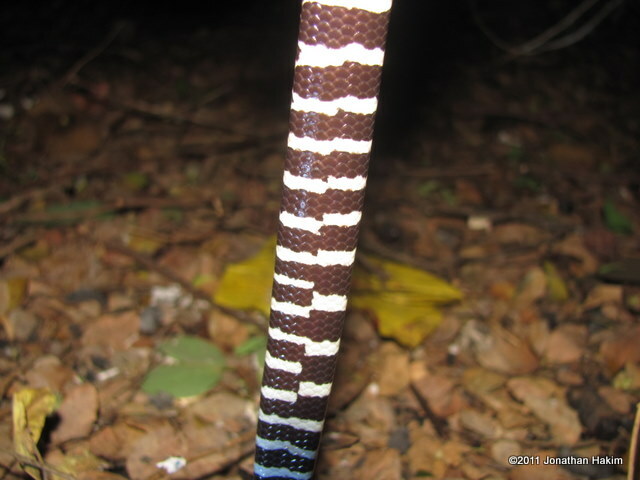 Banded Krait has a triangle-shaped body and much broader bands. Habitat: Humid lowland areas, including forests, swamps, rice paddies, and other agricultural land with moist soft ground where it can dig. Usually found in or near water. Can tolerate brackish water. Spends the day inside vegetation or under cover, coming out at night to hunt. Place in the ecosystem: The Red-tailed Pipe Snake feeds on grubs, worms, eels, frogs and small snakes. It is eaten by larger snakes and monitors. Danger to humans: None – has small head and is reluctant to bite. While it is a rear-fanged snake that can produce some venom, its bite is not dangerous to humans. Conservation status and threats: No known conservation issues. It is occasionally caught in fisherman’s nets and used for food and crocodile feed. Interesting facts: This snake exhibits an unusual defensive display when threatened, hiding its head while lifting its red tail above its body and flattening it in a manner reminiscent of a cobra’s head. 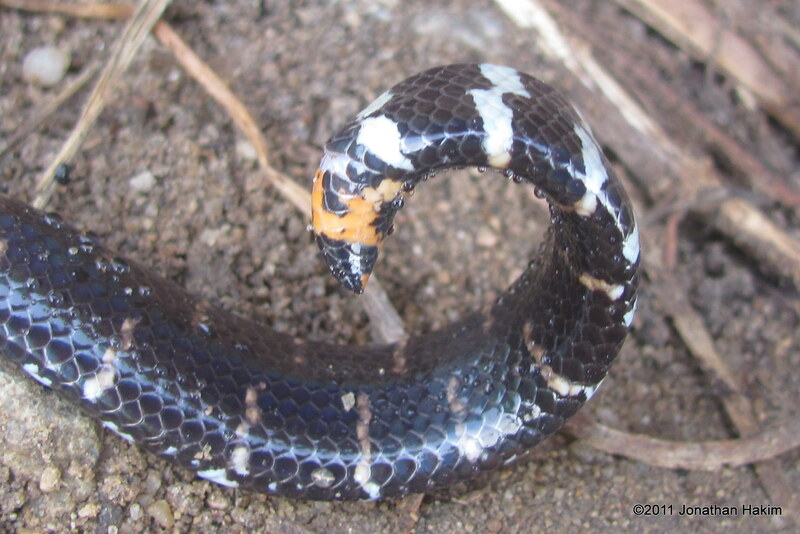 Some sources state that this display appears to mimic that of southeast Asian coral snakes (family Calliophis), while others note the similarities to the cobra. 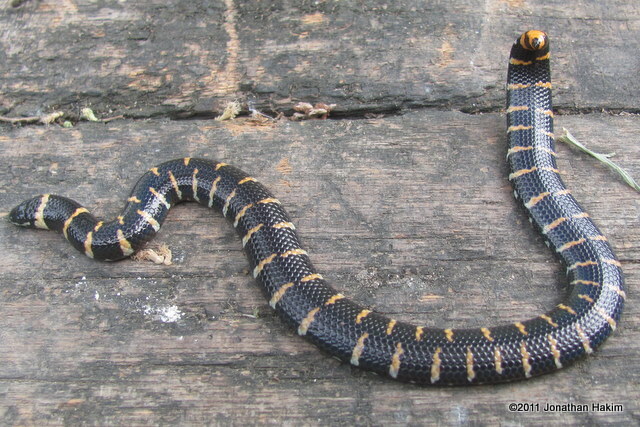 The Thai names for this snake refer directly to the defensive display, including “Ngu Kon Khob”, translated “End of Tail Can Bite Snake”, and “Ngu Sawng Hua”, translated “Two Head Snake”. When traveling I found a still alive but hopelessly trapped Red-tailed Pipe Snake caught in a discarded fisherman’s net. The poor snake was destined to drown or starve to death. Unfortunately, this is not the only snake I’ve found in this situation. Nets and other netting-like trash can lead to the deaths of many snakes when not properly disposed of.